In March 2019, Producer Price Index (PPI) for manufactured goods increased 0.4 percent year-on-year, and increased 0.1 percent month-on-month. The purchasing price index for manufactured goods increased 0.2 percent year-on-year, and unchanged month-on-month. In the first quarter, the Producer Price Index for manufactured goods increased 0.2 percent from the same period of previous year, and the purchasing price index for manufactured goods went up by 0.1 percent from the same period of previous year. Among the Producer Price Index (PPI) for manufactured goods, the year-on-year change of producer prices for means of production increased 0.3 percent, meaning 0.24 percentage point increase in the overall price level. Of which, producer prices for mining and quarrying industry increased 4.2 percent; that of raw materials industry decreased 0.6 percent; that of manufacturing and processing industry increased 0.4 percent. Producer prices for consumer goods increased 0.5 percent year-on-year, meaning 0.14 percentage point increase in the overall price level. Of which, producer prices for foodstuff increased 1.2 percent, that of clothing went up by 1.7 percent, that of commodities went up by 0.3 percent, and that of durable consumer goods down by 0.7 percent from the previous year. The year-on-year purchaser price indices for building materials and non-metallic went up by 5.2 percent, ferrous metal materials increased 1.6 percent, fuel and power increased 0.7 percent, non-ferrous metal materials and wires decreased 1.7 percent. 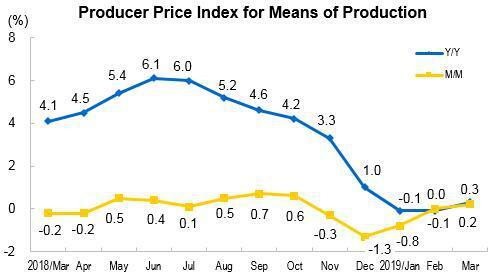 Among the Producer Price Index (PPI) for manufactured goods, the producer prices for means of production increased 0.2 percent month-on-month. Of the total, producer prices for mining and quarrying industry increased 1.7 percent, that of raw materials industry increased 0.3 percent; that of manufacturing and processing industry unchanged month-on-month; Producer prices for consumer goods unchanged from the previous month. Of which, the producer prices for foodstuff increased 0.2 percent, that of clothing and commodities all decreased 0.1 percent, that of durable consumer goods decreased 0.2 percent from the previous month. The month-on-month purchaser price indices for fuel and power, non-ferrous metal materials and wires, both increased 0.5 percent, ferrous metals increased 0.2 percent, Chemical Raw Materials decreased 0.5 percent from the previous month, building materials and non-metallic decreased 0.3 percent. 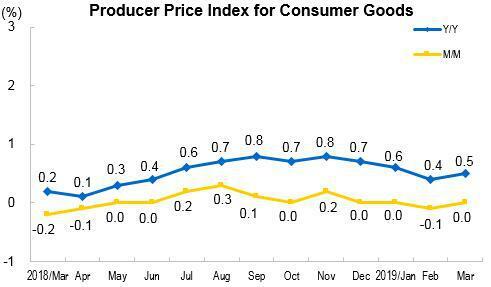 Producer Price Index for manufactured goods consists of producer price index and purchaser price index. 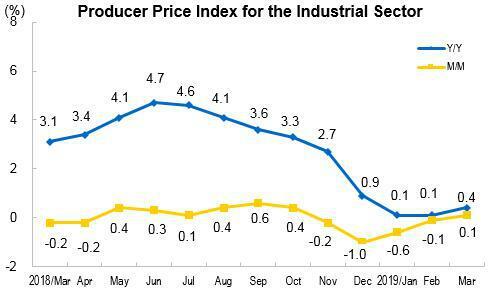 The industrial producer price index reflects the trend and level of prices change when the products are sold for the first time. 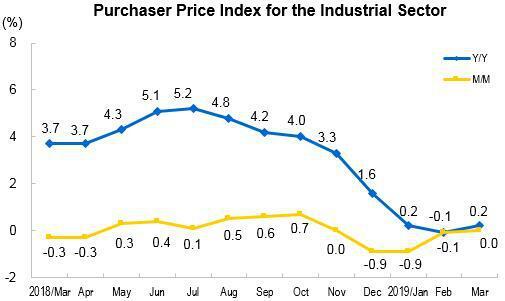 The industrial purchaser price index reflects the trend and level of prices change for the products purchased by the industrial enterprises as intermediate inputs. The statistical survey of industrial producer prices covers prices for over 20,000 products from 1638 subclasses; and the statistical surveys of industrial purchaser prices cover prices for over 10,000 industrial products from over 900 subclasses. Industrial producer prices are collected from combined surveys of key businesses and typical businesses. The key businesses are those with their annual revenue from principal activities over 20 million yuan, and the typical businesses are those with less than 20 million yuan. The surveys cover about 50,000 industrial enterprises in over 400 cities across the country. Industrial Classification is based on the “Industrial Classification for National Economic Activities” (GB/T4754-2017).